The Great Les Gets Mechanical Music Festival has been and gone, but we couldn’t say farewell to all those horns, bells and barrel organs for a whole 2 years without posting a few pics on our blog. 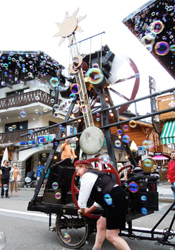 Les Gets claims to be the home of Mechanical Music (though we are still trying to find out just how valid this claim is…), and once every 2 years the whole town spends one weekend in July celebrating the invention of mechanical music in any and every form. There were barrel organs being turned on every street corner, in places they linen the street and took turns to fill the air with their melodies, or were accompanied by singers singing old french songs, making you feel like you were standing on a street corner somewhere in Paris in the 1890s. Actors played their roles in the town square accompanied by the machines, the audience chiming in whenever they knew or guessed the words; old french couples would play one each – 2 parts to the same music – carefully keeping in time with one another with a nod or a nudge. Lucas, now 2 years old, thought the whole weekend was wonderful, enjoying each and every machine, and especially the parade of mechanical music. 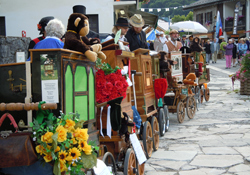 This included various crazy home-made and tenuously musical ‘instruments’, which were ridden or driven through the town centre in a great procession.